This project began with the simple idea of how to improve recumbent bicycles. Through brainstorming efforts by both the capstone team and the sponsor, the concept was narrowed down to creating a more attractive bicycle transmission system. Multiple transmission factors were researched and analyzed (the location of the system, how many parts are used, how big it will be, etc. ), and three designs were developed. Of these three, our sponsor elected two for which we were to proceed with creating prototypes. First, each design's functionality was verified using multiple force analyses. 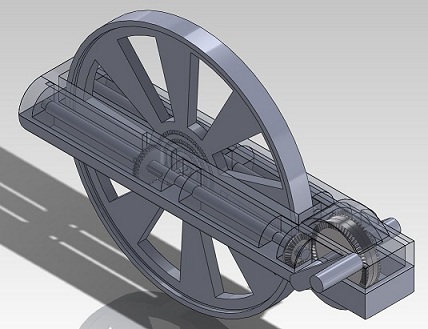 Next, these designs were created using SolidWorks (shown below). After the 3D models were completed, we sent the parts off to a 3D printer to achieve basic plastic components. Metal dowels were purchased and machined as additional pieces used for axles and shafts in the assembly. We have finished assembling the prototypes, which has brought this project to completion. Transfer of SolidWorks models to 3D printer: Some pieces were too small to be reasonably printed. This obstacle was overcome by first switching to a 3D printing company capable of smaller dimensions. 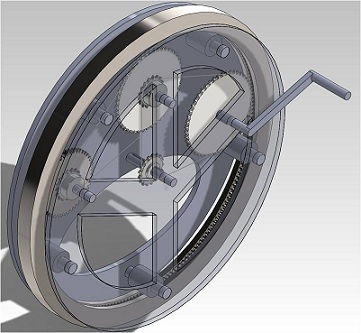 However, some parts still needed to be changed in SolidWorks in order to function properly in the prototype. Finding a decent linking material between sprockets in prototype: We were unable to find a small enough chain with the same pitch as the sprockets to function in our prototype. This problem is still being tackled, with multiple options being decided upon including ribbon, leather, folded tape, and rubber bands. Our products have been completely assembled, and we were able to measure their functionality through their rotation inputs (pedals) and outputs (wheel).